Meet my mom’s friend Julie April and her new puppy, Dahlia. 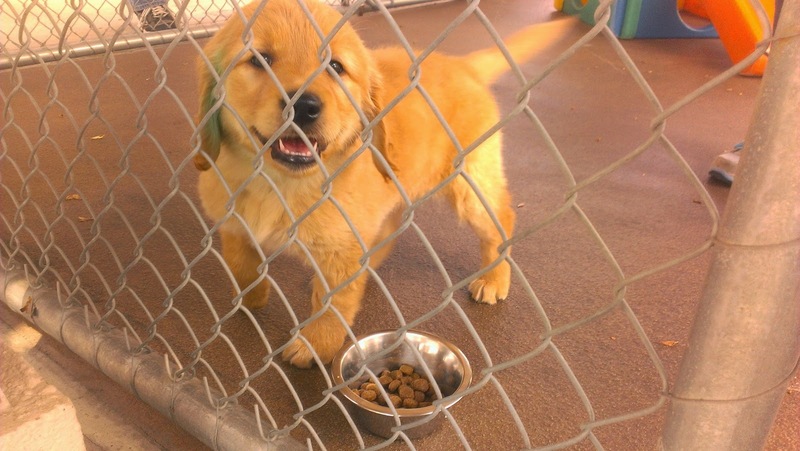 Julie has become one of Canine Companions For Independence‘s newest puppy raisers. The non-profit organization is one of the largest providers of service dogs. 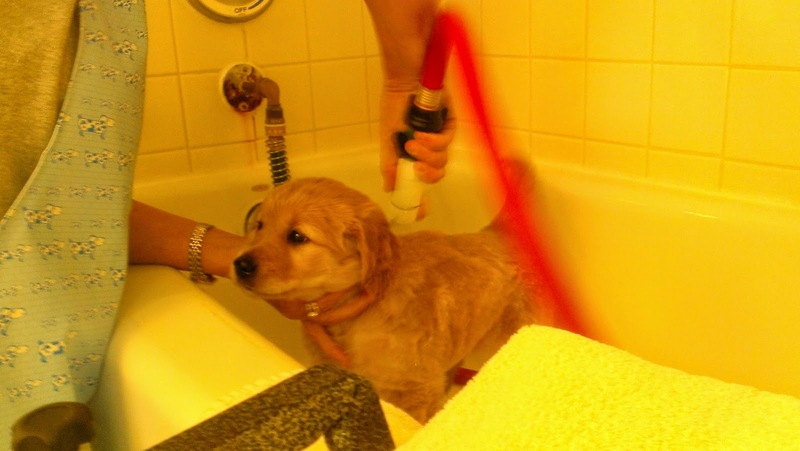 Dahlia, is an eight week old golden retriever puppy whom Julie has made the monumental commitment to raise and train. 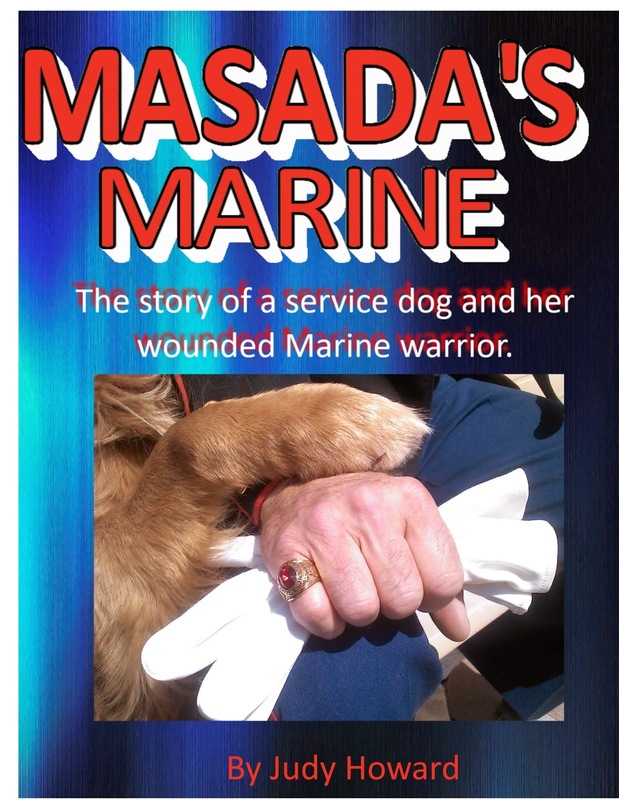 For the next eighteen months I hope you join us as we cheer for Julie’s puppy on its journey to become a service dog, just like Masada, the main dog character in our newest book, MASADA’S MARINE. 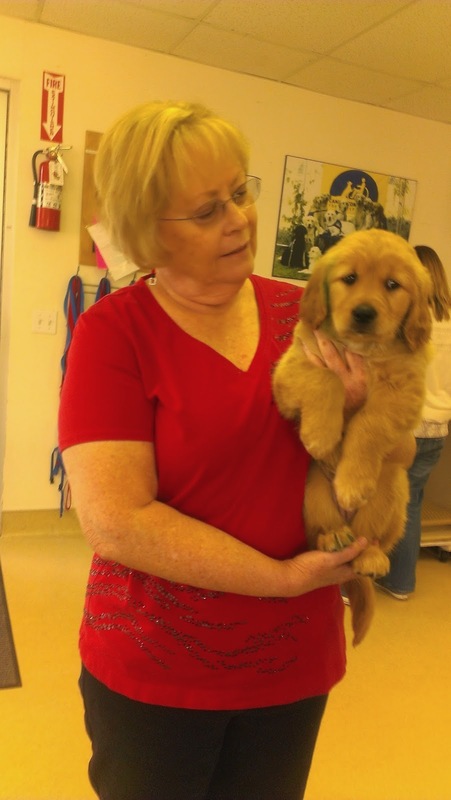 The journey began weeks ago when Julie and Judy attended an open house at the Canine Companions For Independence Open house in Oceanside, California. Mom had visited for research purposes for our book, MASADA’S MARINE, unaware Julie had taken an application to become a puppy raiser. After weeks of interviews and waiting,Julie was approved and the day came to pick up Dahlia. I’ll have to admit I was as excited as everyone. I am a sucker for puppies. Judy and Julie sat through two hours of orientation as the folks at CCI reviewed the intricate care and training rules for this special puppy, bred from a line of ancestors who were already serving veterans with disabilities. After Dahlia's bath, she was ready to go home with Julie and begin her new adventure. But first!! A stop over to meet me. I couldn't wait! I explained to Dahlia the "Cat Rules of Play" I required she memorize if our relationship was going to successful and, as you can see, I was delighted. She listened to every word. I inspected her for any unusual critters and smells. I especially like her puppy breath. We played only a few minutes, as everyone was tired from the excitement of "The First Training Day Of A Service Dog." 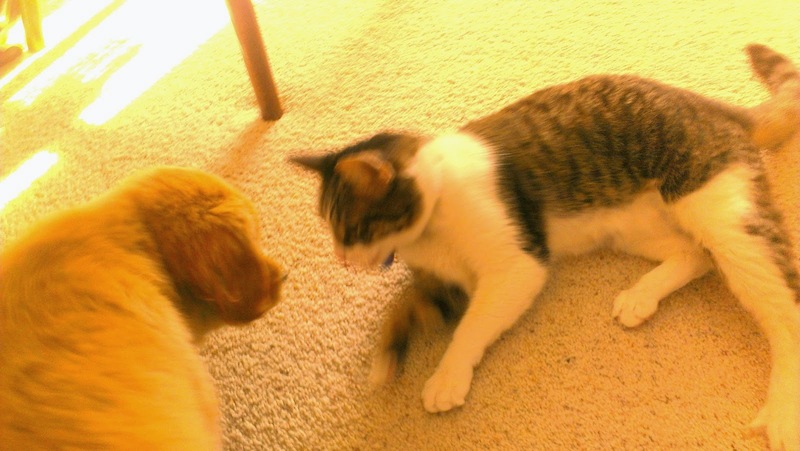 I can't wait until my first playdate with Dahlia. I'll let you know how it goes. Next weekend we are going camping at the beach. I'm Dahlia and I really like you, Sportster. I've asked mom if we could go over and play today as I've woren out Kona! I've gotten better at doing what I'm told but can't wait to discuss it with you to see if you have the same kind of rules. I like living with Julie, Kona and Rocky but she doesn't like me chewing on the rugs. That's my favorite thing! Maybe you can help me decide what are the good things to chew and what are the bad things. I think Grandma Judy has rules too! Well, see you later.....I look forward to our play date! 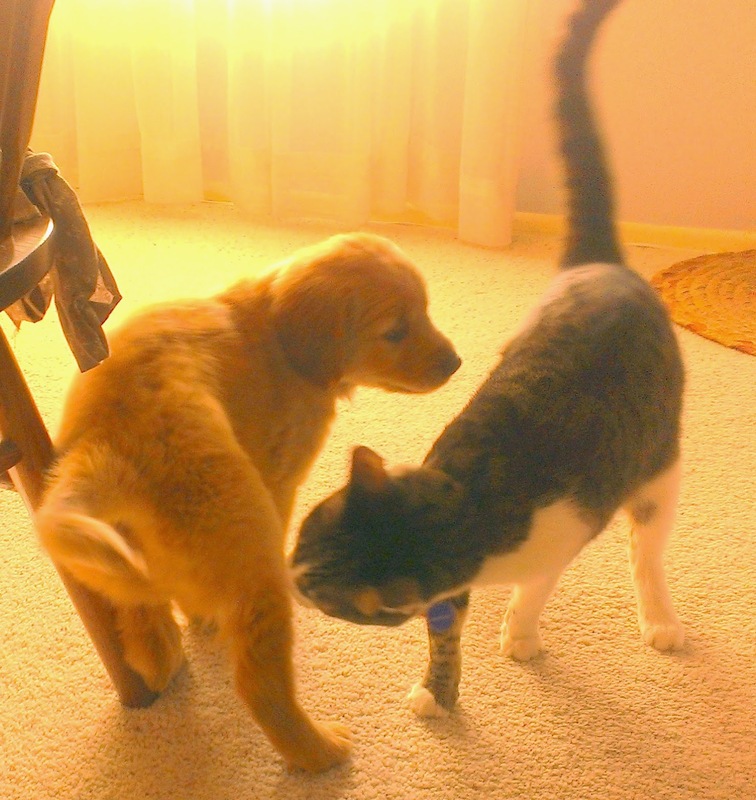 George and Gracie checking in here: We can't understand why you'd be excited about such a loathsome creature like a dog, but this one is pretty darn cute. 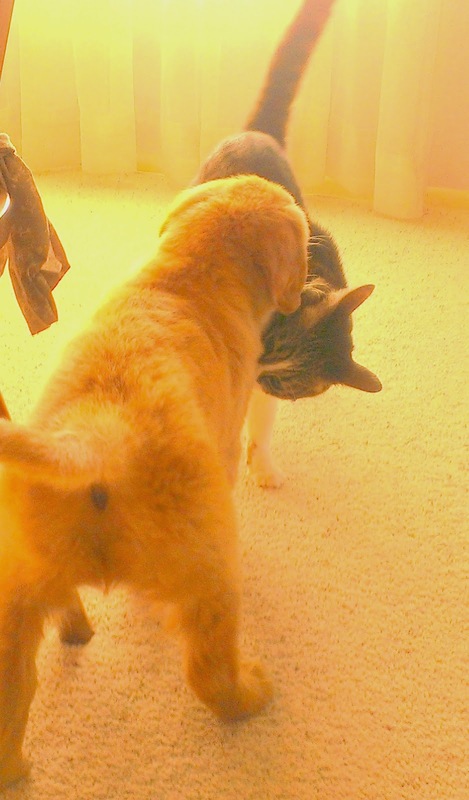 I guess we should be more open minded since we've never really met any dogs up front (and back end) personally. We will be meeting our step-dog this summer, so your news is encouraging and we'll try to keep an open mind. Good luck on the training. I'm "hooked" and ready for the next part of this story !